Gagosian Gallery will present an exhibition of works by Arakawa. 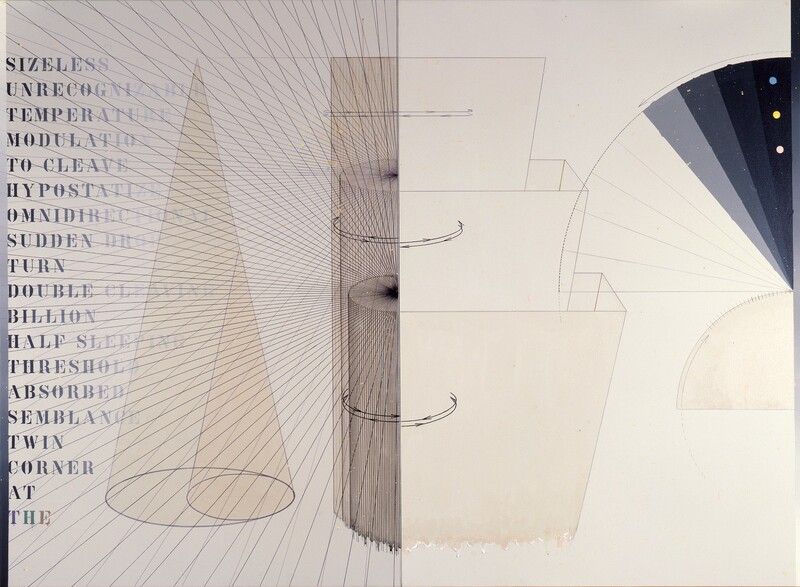 This exhibition examines the period during which Arakawa worked in two dimensions, using paint, ink, graphite, and assemblage on canvas and paper to demonstrate what critic Lawrence Alloway called “the logic of meaning, the texture of meaning.” From the mid-1960s onward, Arakawa began to augment the simple topography of his diagrams with additional referents, sometimes engaging other sensory faculty or using prompts and instructions to make the viewing of painting into an active endeavor. In A Couple No. 2 (1966­–67), the bird’s-eye view of a bedroom is mapped out: bed, table, pillow, head, foot, lamp. The image shows only the places where the corresponding physical elements would be, had “a couple” been literally depicted. In this way, the painting becomes a catalyst for the viewer to independently construct an image of a couple in the mind’s eye, rather than receive its depiction directly from the painting.